...and those who do not. Both are pretty committed to their beliefs. While a quick survey of my quilting bee, Loose Threads, showed that 7 of us didn't prewash on a regular basis. I am the lone one who prewashes everything. 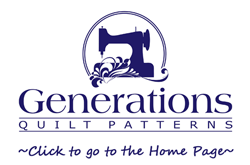 All biases aside, for the purposes of machine quilting, I believe you should prewash quilt fabric or at a minimum pretest your quilt fabric if any one of the following conditions apply to the quilt you will be working on. A blue washout marker or other water-soluble marker will be used to mark the quilt top. Water-soluble thread will be used for machine trapunto and the thread must be removed with water. The dense machine quilting will distort the quilt top enough to require blocking. Starch will be applied to the fabric either during the piecing process or to the backing. Simply put, prewash your fabric before piecing if the quilt will be washed or made wet at some point in its life. If you are looking for the “puckered” look of an antique quilt, pretest the fabric instead of prewashing it to ensure that you are not using any fabrics that will bleed. If you find the hand of the fabric too limp after it’s washed try starching the fabric. I keep a blue bottle of Sta Flo (found in the local grocery store) and dilute it one part liquid starch and one part water. Keep it in a spray bottle so its ready to use. Spray your fabric until its evenly damp. Hang it to dry and then iron. I find there's less flaking that way. Starch can burn, so remember to keep the iron moving. Don't starch fabrics for storage. Starch is a food product (corn)and can attract critters like silverfish. Ugh! If starch build-ups on your iron, wipe it off when iron is cool with a rough terry towel soaked in white vinegar. The Magic Eraser also works to remove buildup on the bottom of your iron. Dampen it and use when the iron is cool. 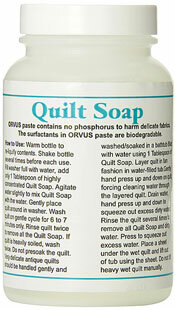 The decision to prewash quilt fabric is yours, and your alone, to make. Make it an informed decision.